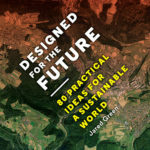 For Designed for the Future: 80 Practical Ideas for a Sustainable World, Jared Green asked 80 architects, landscape architects, urban planners, non-profit leaders, journalists, and artists—all people shaping the future of our built and natural environments—the same question: what gives you hope that a sustainable future is possible? The ideas in the book range from policies, like congestion pricing in London, to resilience-building projects, like The Sand Engine in the Netherlands. Together, they are a fascinating glimpse at what is happening at the frontier of sustainability in cities around the world. TheCityFix sat down with Jared to talk about technology, urban greenery, and why he is so optimistic about the future. What is the role of these specific, local examples for generating change at a global level? First, our past is tied to our future. What has worked over the ages is what will carry us through to the future. Second, we also need a break with the past, in some regards. New technologies may offer solutions to the problems we haven’t confronted before. Third, communities are the root of sustainability. We must enhance every community’s ability to sustain itself. Fourth, we must harness the efficiency of natural systems by mimicking them. 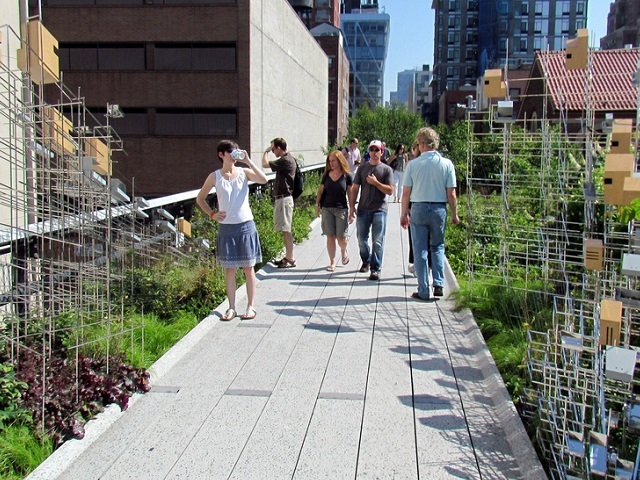 Green infrastructure uses natural systems to generate ecosystem services that benefit us all. Lastly, throughout all these human efforts to create a more sustainable relationship with our environment runs a deep thread—our quest for beauty. We cannot achieve a sustainable future if it’s not appealing on an aesthetic level, if we don’t connect with it. I think these deep motivations, which take reality in local examples, need to be better enabled on a global scale if we are to survive long term. Some ideas look toward cutting-edge technology, while others look back at design principles that have been around for years. What do you see as the balance between the two? Throughout human history, we have tacked back and forth between reaching for new technologies, because we have new problems to solve, and also relying on age-old approaches that work. I think the balancing factor between the two is community. What I learned from talking to all these contributors is that sustainability is ultimately about the approaches and technologies that help a community survive over the long term. Communities’ problems, in all their diversity, will always be solved through a unique mix of new technologies and age-old techniques. It’s about communities having opportunities and options so they can find the right mix. Why do you believe that public participation and community engagement are integral to sustainable cities? Bad ideas inflicted on communities without their approval are just not sustainable. Urban renewal in the West, for example, was largely a bust. In Eastern Europe, the Communists divorced the city from nature and isolated people in alienating concrete blocks. For the past few decades, China has been moving vast numbers of people into towers that have destroyed existing communities. Public participation is critical to creating buy-in for a vision of a sustainable city. If it has to be forced on you, then it’s not likely to work long-term. Reusing and repurposing different parts of the city is a big theme. What lessons does this have for rapidly growing cities in developing countries? The rapidly growing cities of the developing world are also reusing and reconfiguring resources to serve change and expansion. In Africa and Asia, many countries were creating cities long before Western countries were. Today, as China seeks to move from a manufacturing to a service economy, they are already looking at how to clean up their rivers, transforming them from being just conduits for industrial output to sources of recreation, just like the West is working on now. I hope emerging cities everywhere will think long-term about their infrastructural investments. Some cutting-edge infrastructure in the West is multi-use. For example, Sherbourne Common in Toronto is both a park and wastewater treatment plant. There are opportunities to leap-frog past the rather limited single-use infrastructure of the past. 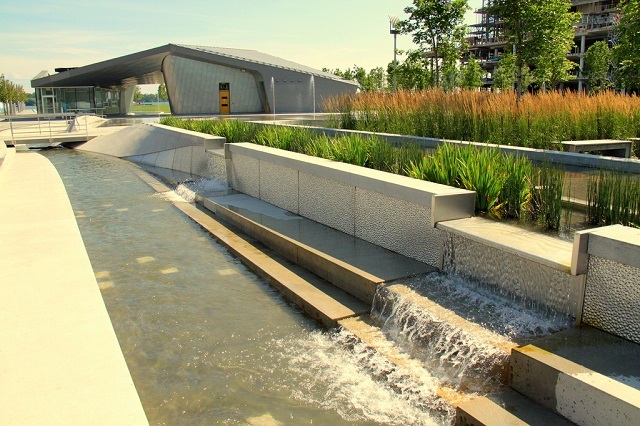 Sherbourne Commons in Toronto is both a waterfront park and a water filtration plant, helping the city manage waste while contributing to the local aesthetic at the same time. Photo by wyliepoon/Flickr. What is one idea that you can see spreading to cities worldwide in the near future? Green infrastructure—using natural systems to achieve infrastructural goals—is likely to spread because it’s more resilient and does more things at once than the alternative: “grey” or concrete infrastructure. Already, many state and local governments in the U.S. and European have bought into these approaches, which offer many benefits at once and save money. Many green infrastructural approaches are not new. For centuries, humans have been managing water using nature. We’ve also always planted trees. It’s just recently with the move to cities in the last few hundred years that we’ve somewhat lost this connection, but it’s coming back. To order the book and learn more about the future of sustainability, click here.